Douglas C. Tomanelli, D.C. has been involved with sports all his life and is very familiar with many types of sprain/strain injuries. He studied Biology at Suffolk College in Long Island, New York. He furthered his studies at Life University in Marietta, Georgia where he attained his Doctorate of Chiropractic. He has attended many postgraduate studies on Whiplash injuries, Rehabilitation and other treatments. 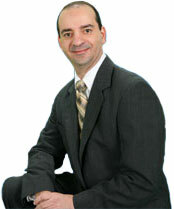 Member of Business Networking International for 6 years and served as President, and Vice president. For 9 years taught Wellness classes every week in my office for the community. Instructs medical doctors with power point presentations about soft tissue injuries, treatment standards, and proper documentation regarding the mechanics of injury for motor vehicle accidents. For 9 years taught in the community about wellness and nutrition throughout the Chattanooga area. Sat on the National Republican Congressional Committee as a physicians advisory board for 4 years. Awarded Physician of the year in 2005 by the National Republic Congressional Committee. Taught and instructed children in Gymnastics for 4 years. Lead a group of 25 children in summer day camp every summer I was in undergraduate College.